As I was wondering what to blog about tonight, as a lead-in to the next leg of the journey along that road less travelled to Canterbury, I turned on the TV just at the point of an interview between Piers Morgan and Sir Cliff Richard where they were showing an example of the classic red Routemaster Double Decker used in the road movie musical “Summer Holiday” (and you just gotta click on the link to see the Youtube video of this enduring image – it’s so sixties and yet so hilarious too!) . When you’ve lived in London for a while you forget some of the things that may have made this “the” city for you. One of them is that big red double decker bus, and the other that iconic black London cab. Unfortunately, watching that interview with Sir Cliff, I was also reminded of the anarchic TV comedy “The Young Ones” as I watched Piers trying to be serious when it came to talking about that enduring image of the bus Cliff Richard drove in the movie. The scene I was particularly reminded of is the one where The Young Ones spurn the romantic sixties’ ideal of driving one across The Continent (if not the world) by driving their bus off a cliff near Dover before it even gets there, but click on the link as there’s more humour to it than that. I probably thought of this because, not so long ago, one of the local buses near where I live ended up driving into the front window of a local real estate business as shown below – almost emulating the scenario showing in the Cliff Richard Youtube film clip where the bus drives into a signpost. The simple fact remains that the classic double decker manages to take center stage no matter whether it is the one with Cliff or the one over the cliff. The London Transport Museum is a great place to see the history about how they came about, but that’s not the same as taking one of them somewhere. The “hop on, hop off” Routemaster was the bus that was great to take when I first lived here in the early nineties. I have fond memories of running along and clambering on board down Oxford Street, as well as pulling the cord to hear the classic “ding, ding” sound (but which the conductor, if I remember rightly, was the only one allowed to do that on the Routemasters). 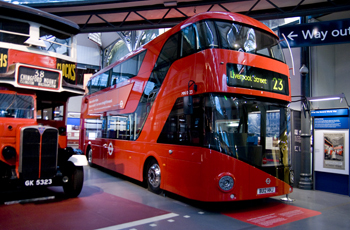 Supposedly the new bus, as shown in the picture below, will recapture some of the magic of that when it comes to town. As it happened (and without knowing about the BBC2 interview with Cliff and a red bus in it), I found myself in a position that I had to find a way today to get on to seeing those places that I had discovered, five years ago, as perhaps being the likely places where The Canterbury Tales were first supposedly told on the Pilgrim’s Way some 700 years or so ago, but still not be out of mobile reception range for an important phone call back on a house that my wife and I are looking to buy. Simply getting in a car and driving to Deptford, as well as the destinations I’ve got in mind beyond that, did not seem the best way to get by. So I decided to get a little help from my big red friends. Perhaps harking back to travels from France to Spain over the Pyrennees in 2008 – all by local transport (including taking the little Basque train from the border at Hendaye on into San Sebastien) – I also had the thought after the interview that perhaps I could look at more unique ways to get to Canterbury in general that would fit better with how a group of light-hearted and enlightened travellers might all get there together nowadays, and in a similar vein to how they all did by coach and horses back then in 1370 or 1380 something. So it was starting with the No. 36 to New Cross Gate, and then the 177 towards Thames Mead after that, that I got to the first stop on my magical mystery Brit pilgrims’ tour. This is where I had learned about there being the little known site of a medieval coaching inn, of perhaps the same type as The George Inn in Southwark and The Tabard that the original travellers met at in The Canterbury Tales. Now the question that has occurred to me tonight after this is: just how much further can I get by double decker, or even just local buses, before I am forced to take a train or a taxi somewhere or walk a long distance? OK, so maybe I’m mad, but it seemed to add an amusing little touch to this few days’ escape from London for someone looking for a short three day excursion with a mix of a sixties movie culture and romantic travel ideal with a New Age twist. 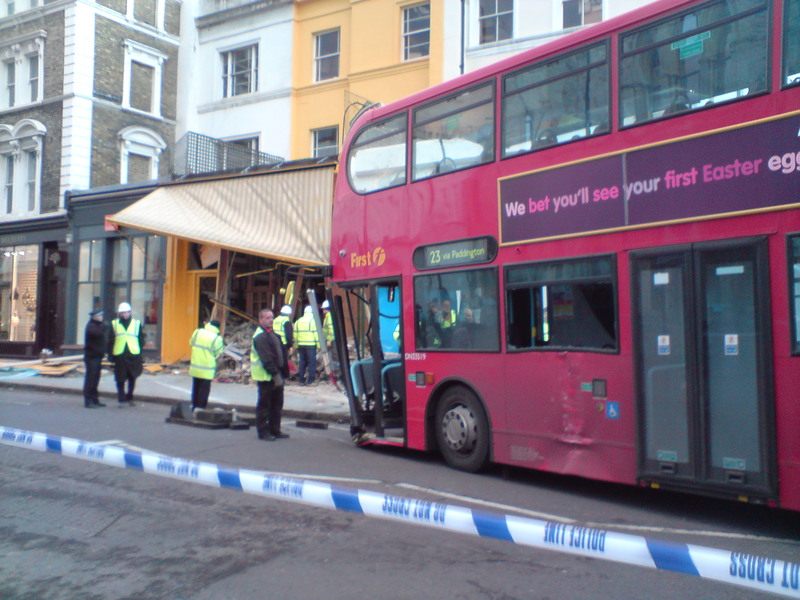 This entry was posted in Canterbury, London and tagged double decker. Bookmark the permalink. Hi Matt, love reading your blog. Congratulations! You have been awarded The Versatile Blogger Award. Stop by at http://notjustagranny.wordpress.com/2011/06/04/versatile-blogger-award/ for more details. Thanks, Cindy. I have been monitoring my blog stats in recent times, as part of my way of figuring out what resonates for the book (as not really into just writing a book for my own amusement), and saw that this blog post had received traffic of late – and not really able to figure out why until I came back here to check it out. I then felt incredibly guilty when I did, as I realised that it was possibly something to do with this blog post being tied to your comment passing on the Versatile Blogger Award to me, and so that comment helping to draw this post to people’s attention with what they pick up in their search engines. Or at least that’s what I suspect it is.